Oenopota pyramidalis, copyright Anders Warén. Oenopota is a genus of small to moderate-sized conoids found in the Arctic Ocean and northernmost Pacific (Powell 1966). 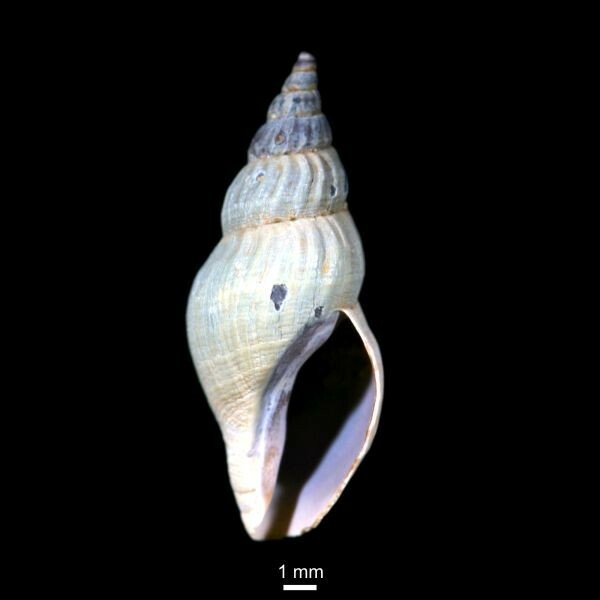 Characters (from Powell 1966): Shell small to moderate-sized, 10–23 mm, elongate-ovate, with tall spire of rounded whorls and rounded body-whorl, tapered to short spout-like canal, which is flattened at its extremity but scarcely emarginate. Protoconch narrowly papillate of about 2–2.5 whorls, initially smooth, then developing three spiral cords crossed by spaced axials, enclosing squarish interspaces. Adult sculpture of strong rounded slightly oblique axials, extending from suture to suture and over most of base, overridden by numerous spiral cords. Outer lip with broad shallowly arcuate subsutural sinus. Periostracum thin, pale brownish. Radula consisting of pair of marginals of hilted dagger type, each with conspicuous basal spur.